This can’t-miss sale features a breathtaking selection of Rockport school paintings, including over two dozen works by Emile Albert Gruppe. Bricher's Near York Beach, Maine, estimated at $40,000-60,000. It’s time for the most anticipated premier auction of the summer season - James D. Julia's annual August Fine Art, Asian & Antiques sale to be held on August 16th-18th, 2017. This $4+ million auction is bursting at the seams with over 1,600 lots of enticing offerings, and includes a wide selection of paintings and sculptures, furniture, historical items, weathervanes, antiques and Asian articles, and other remarkable rarities. All items will be available for preview at James D. Julia’s Fairfield, Maine gallery on August 15th from 9am-5pm, August 16th through 18th from 8am-10am; and during each auction session. Special previewing can be arranged by appointment. Each day of this three-day spectacular sale features truly extraordinary lots which represent the breadth and depth of James D. Julia’s Fine Art, Asian & Antiques division. These once-in-a lifetime highlights from each day are certain to catch worldwide attention for their rarity and spectacular appeal. Wednesday, August 16th offers works appropriate for any top tier museum of fine art. 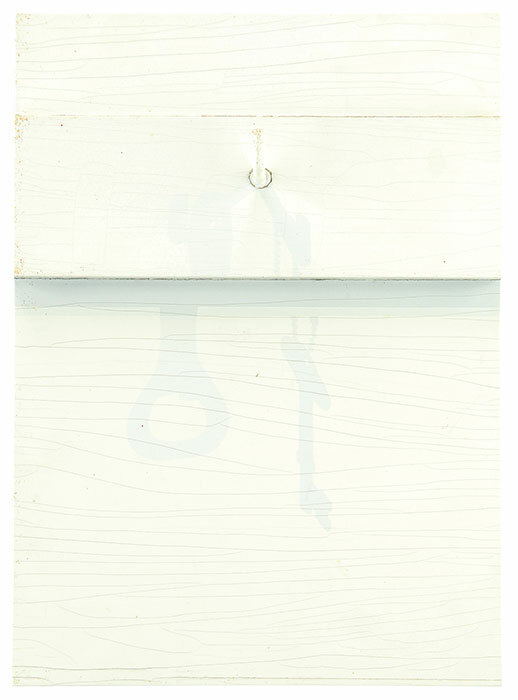 The first feature from day 1 is #1159A, Jiro Takamatsu’s Shadow of Two Keys (Skeleton & Church Key) NO. 211, conservatively estimated at $30,000-50,000. This piece is signed and dated by the artist and retains its label from the Tokyo Gallery. This thoughtful work, which descended through the family of Robert H. Chase of Greenwich Village, NY, was discovered hanging in the kitchen of a Maine home. 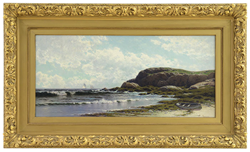 Another day one highlight includes lot #1040, Alfred Thompson Bricher’s Near York Beach, Maine. This handsome work, which was found in a Maine home, has full provenance and was featured in Gill's Twenty-Sixth Annual Exhibition of Original Paintings, Stadden's Art Galleries, Springfield, Mass, 1903. It is estimated at $40,000-60,000 and is being sold without reserve. Thursday, August 17th presents treasures with phenomenal historical interest. Lot #2011 is a Nantucket Presentation Sword given to Mexican War Hero Major Moses Barnard for “Planting the 1st American Flag on Parapet at Storming of Chapultepec, September 13, 1847.” Moses J. Barnard was born in 1819, the eleventh child of Cromwell and Sarah Barnard from Nantucket, MA. His grandmothers were from the Coffin and Joy island families. This is most likely the only historic sword presented by the mostly pacifist Quaker population of Nantucket Island. This exquisite sword retains most of its original gold plate and is estimated at $35,000-45,000. It comes with full provenance as well as its original scabbard and sleeve. Another notable offering on day 2 is lot #2062, an enormous photographic archive of American military engagements, including about 33,000 vintage and first generation photos, 18,900 negatives, 500+ slides, and other materials. It is estimated at $20,000-40,000. This archive is a lifelong collection of the consignor who has published a few texts utilizing some of these groups; most, however, are unpublished. Much of this archive is dedicated Air Corps and aviation. The images are concentrated in WWI-WWII era, but there are earlier photos and some from the from Korean and Vietnam wars. This is a once in a lifetime opportunity for a museum, publisher, or stock photo company to purchase an astonishing range of monetizable content focused on a century of America at war. Friday, August 19th features wonderful Asian selections that exemplify James D. Julia’s commitment to this important category. Lot #3608 is an important pair of Famille Rose “Three Boy” vases, is estimated at $20,000-30,000. Each vase is decorated with bats and lotus scrolling on a dual glazed ground; their tops are accented with a ring of ruyi and traces of gilt. Both are detailed with three fully dimensional boys at play: two perched upon the shoulder and one pulling a rope below. Both are marked with a red Qianlong seal on a turquoise ground. Also in day 3 is lot #3569, a Qing Dynasty Huanghuali and hardwood corner leg side table, estimated at $20,000-40,000. This table was purchased in 1923 in Peking and has remained with the original owners, the Hobart family, ever since. Items from the Hobart collection established the benchmark for the Chinese antiquities market in the United States at two famous sales conducted at Sotheby's, New York in 1969 and 1970. Those are just a few of the highlights from this massive three day sale, but they certainly don’t tell the entire story. In fact, day one will launch the sale with almost 650 lots of outstanding merchandise, with the spotlight on an amazing selection of paintings by American and international artists. James D. Julia is the leader in works featuring Maine artists and themes and Rockport School paintings. This sale will only serve to solidify that well-deserved reputation. Maine’s Waldo Peirce, and his lesser known but not lesser talented wife Alzira, are well represented in this sale, with almost 20 lots between the two of them on offer. All were consigned directly through descendants of the Peirce family. Lot #1007, Waldo Peirce’s Waldo and Ernest Hemingway Out Shooting, is estimated at $6,000-9,000. 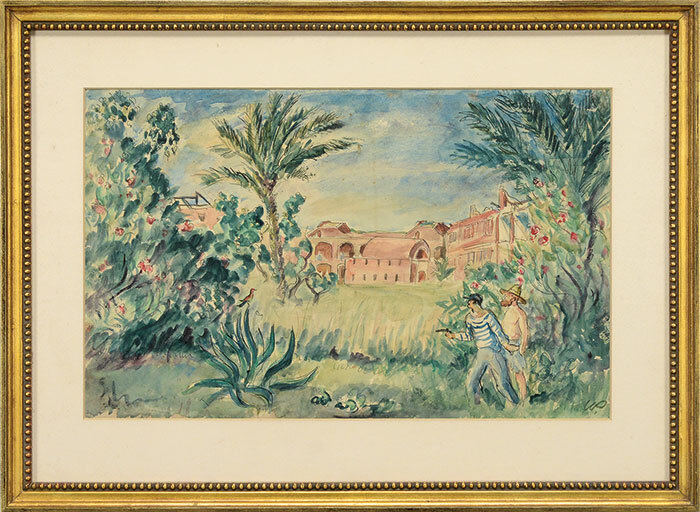 Peirce and Hemingway were lifelong friends; this watercolor was painted when they were working for the American Field Service during World War I. 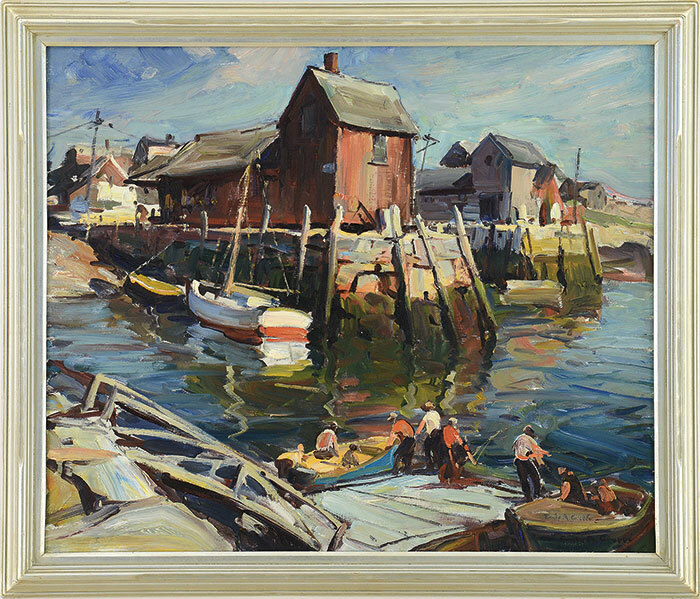 This sale’s selection of Rockport School paintings is the broadest and deepest in recent memory and features artists including Thieme, Glackens, and Morrell, among others. The big fish in this category has to be works from Emile Albert Gruppe, with 25 examples on offer. Lot #1081, his Motif #1, featuring the iconic Rockport landmark, is estimated at $15,000-25,000. This sale goes to the dogs with its spirited collection of sporting and canine themed paintings. 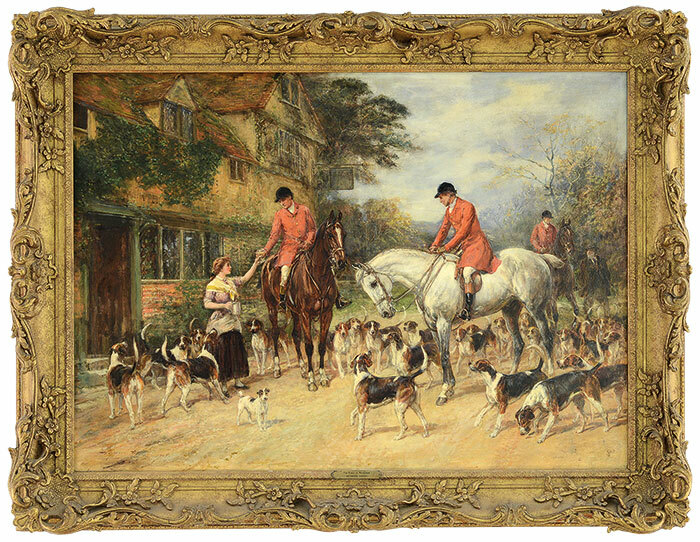 Lot #1340, Heywood Hardy’s The First of November, pictures sportsmen on their horses and dozens of eager hounds and is estimated at $40,000-60,000. This painting, from a Woodstock, VT collection, has provenance to Christie's, South Kensington and was sold there in 2010. Day one rounds out with a fine selection of other outstanding works, including sculptures, prints, and a robust selection of old masters. Over 25 ocean themed paintings are on offer, including examples from some of the most desirable 18th and 19th century maritime artists. 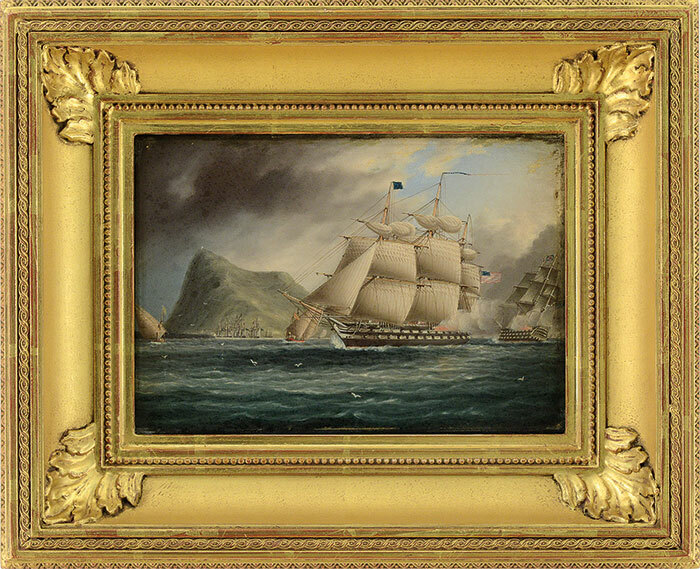 Lot #2240, James E. Buttersworth’s Saluting Off Gibraltar, is estimated at $15,000-25,000. This work pictures a Mediterranean scene with a three-mast American frigate sailing right to left with Gibraltar in the background. A presidential caliber offering in the history category is lot #2003, John Glen, Jr.’s archive, estimated at $30,000-50,000. Col. John Glen Jr. was Quarter Master of the Continental Army of the Northern Department and a close associate of George Washington, who on occasion stayed at the Glen Plantation. This archive includes his inscribed Revolutionary War silver mounted flintlock officer's fusil. This fine firearm presents beautifully, was made for a man of means, and represents the finest achievement in mid 18th century American gun making. His archive also includes two documents from the mid-1700s and a chair which was in the Glen home when George Washington visited there in 1775 during the Revolutionary War. Washington could very well have sat in the chair and could have handled this fusil on offer as part of this archive. It’s easy to catch wind of this sale’s full range of antique weathervanes, with about 30 premier examples on offer. It’s off to the races with lot #2144, an "American Girl" large horse and sulky molded copper weathervane, estimated at $15,000-25,000. This example is from the last quarter of the 19th century and is attributed to Fiske & Co., New York. Other specialties featured during the second day of this sale include accessories, clocks, folk art, carvings, and rugs, among others. A number of eye-catching rarities from these categories are from the Livingston Family Estate, originally from Oyster Bay, Long Island. The third and final day of James D. Julia’s annual summer auction is dedicated to Victorian and contemporary decorative arts as well as Asian selections. Over 370 lots of quality merchandise will be offered on day three. Turn of the 20th century furniture makes strong showing in this sale. An up to the minute highlight here would be lot #3037, an oak tall case clock with a marked Tiffany & Co. dial, estimated at $6,000-8,000. Its extensively carved case was produced by Tobey Furniture Co. of Chicago. It is believed that this clock was manufactured in the 1886-1909 timeframe and that its movement is probably an unmarked example manufactured by J.J. Elliot Co. Ltd. of London. Also noteworthy is lot #3069, a standing Swiss Paillard "Dinner" model music box. 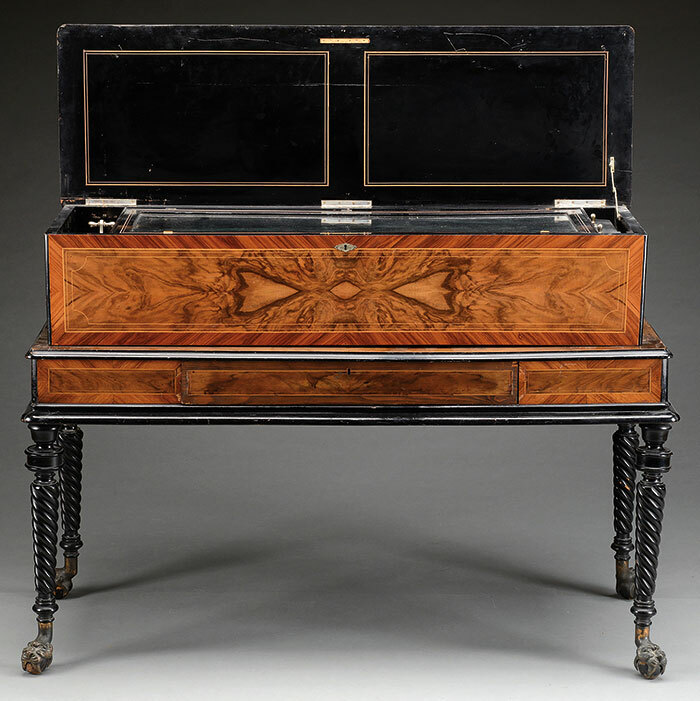 Its rectangular burled walnut case has mahogany cross-banding and ebonized borders and is fitted with the original fired machine consisting of three combs and a zither attachment with five 18" cylinders, each playing six tunes. This remarkable example, estimated at $4,000-6,000, was purchased from Ruth Bornand in Pelham, New York, in 1979 and is described in an article by Lynn Ames in the New York Times’ Sunday edition dated August 19th, 1979. Day three concludes with a selection of over 170 fine Asian items, with the finest examples in furniture, sculptures, paintings, jewelry, cloisonné, jades, and porcelain on offer. Lot #3615, a Qing Dynasty Chinese jade vase is estimated at $12,000-15,000. The vase is carved from a grayish stone with russet inclusions. It is magnificently detailed with a band of archaistic carvings above a ring of lappets accenting its splayed foot, two large masks and ring handles, and smaller handles on its neck. . And lot #3604, a 20th century Chinese scroll painting depicting a beautiful woman holding a flower after Zhang Daqian (1899-1993) is certain to bloom given its $2,000-4,000 estimate. 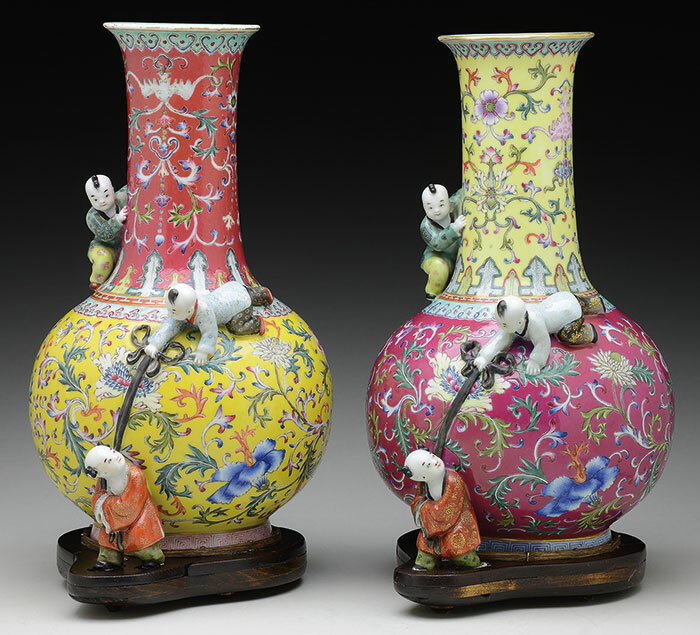 More information on James D. Julia's outstanding three-day Summer Fine Arts, Asian and Antiques auction, as well as the full catalog, can be found online at http://www.jamesdjulia.com. In addition to pre-bids, telephone bids, and in-person bids, James D. Julia accepts bids via Invaluable.com as well as Bidsquare.com. Bill Gage, Tony Greist, and Katya Tilton welcome your questions and inquiries; they can be reached at antiques@jamesdjulia.com or by calling 207-453-7125. James D. Julia’s next Fine Art, Asian & Antiques auction will be held in February 2018. James D. Julia, Inc., one of the top ten antique auction antique houses in North America as measured by annual sales, is headquartered in Fairfield, Maine. The company also has an office in Boston, Massachusetts. In business for over 45 years, the company conducts high-end antique, collectible and fine art auctions throughout the year. James D. Julia has routinely established new world records through its sales events. The company consists of three key divisions, including Rare Firearms; Fine Art, Asian & Antiques; and Rare Lamps, Glass & Fine Jewelry. Each division is regarded for its excellence and is staffed with world-class specialists to guarantee fair and professional authentication, identification, and valuation services. For more information on James D. Julia, please visit http://www.jamesdjulia.com. Peirce's Waldo and Ernest Hemingway Out Shooting, estimated at $6,000-9,000. Gruppe's Motif #1, estimated at $15,000-25,000. Takamatsu's Shadow of Two Keys (Skeleton & Church Key) "No. 211," estimated at $30,000-50,000. 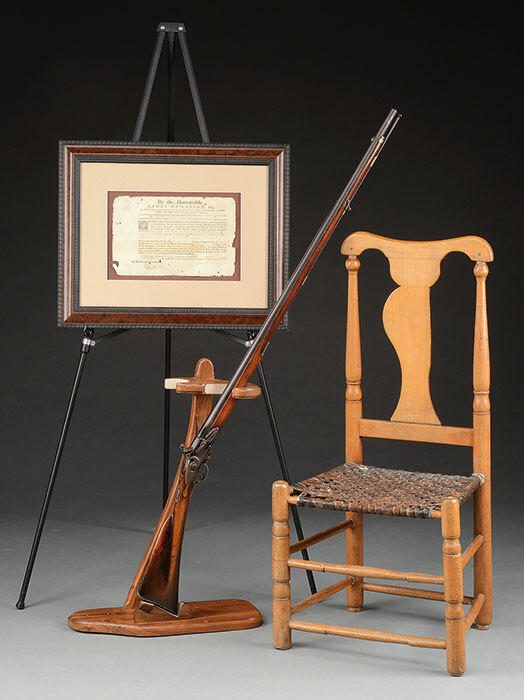 Glen, Jr. Archive, Including His Inscribed Revolutionary War Flintlock Officer's Fusil, estimated at $30,000-50,000. Nantucket Presentation Sword to Mexican War Hero Major Moses Barnard, estimated at $35,000-45,000. 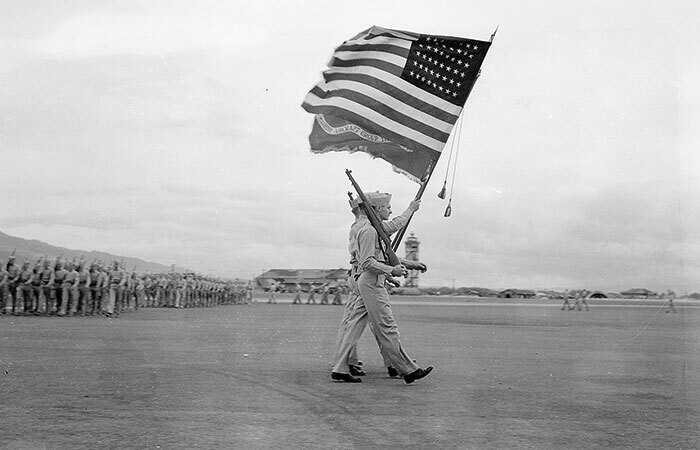 Photographic Archive, Mostly WWI-WWII, American, Allied, German, and Japanese, estimated at $20,000-40,000. 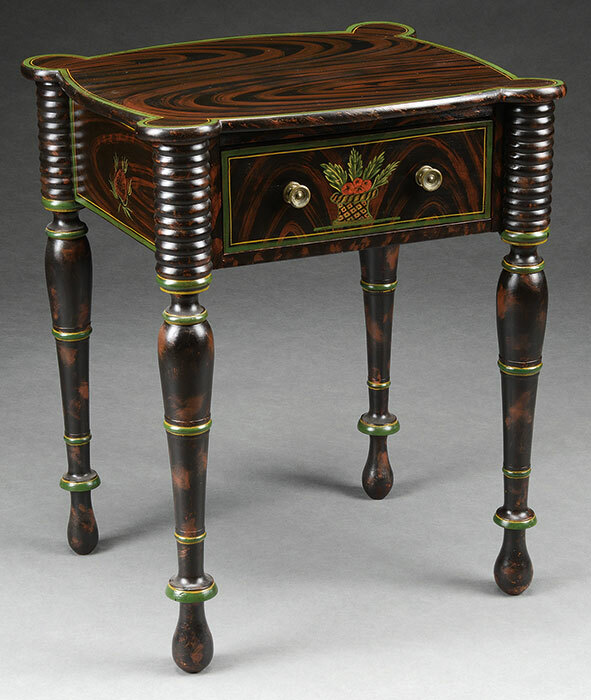 Sheraton Maine Painted One Drawer Stand, estimated at $15,000-25,000. Buttersworth’s Saluting Off Gibraltar, estimated at $15,000-25,000. Carved Oak Tall Case Clock with Marked Tiffany & Co. Dial, estimated at $6,000-8,000. Paillard "Dinner" Model Music Box on Stand, estimated at $4,000-6,000. 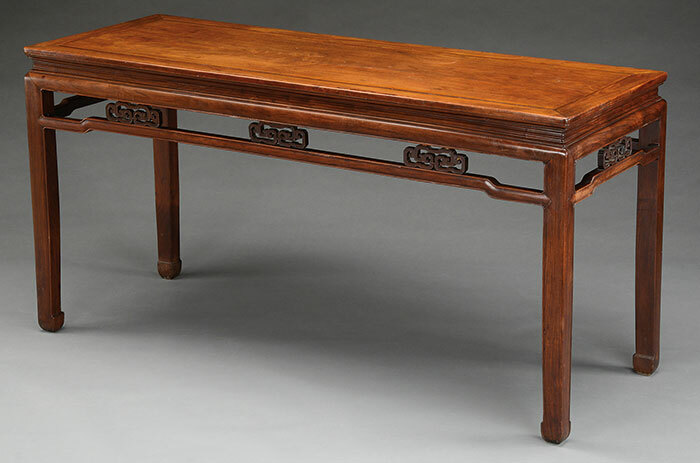 Huanghuali and Hardwood Corner Leg Side Table, estimated at $20,000-40,000. Two Famille Rose "Three Boy" Vases, estimated at $20,000-30,000. 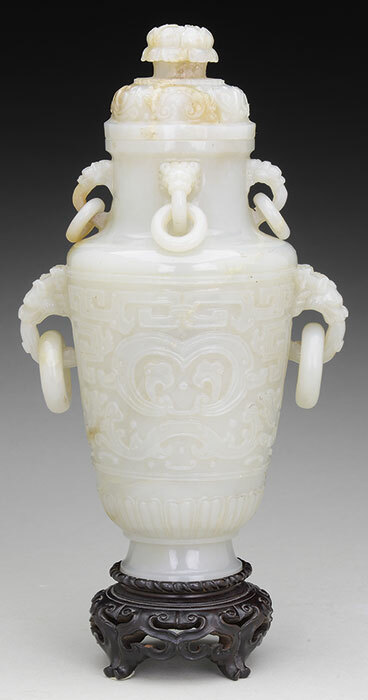 Jade Covered Vase, estimated at $12,000-15,000. Hardy’s The First of November, estimated at $30,000-50,000. Scroll Painting of Standing Maiden in the Manner of Zhang Daqian, estimated at $2,000-4,000.